A wavelength-controlled stage with accordion legs containing gold nanorods (left) and gold nanospheres (right). The sequence of illumination by light-emitting diodes (LEDs) positioned next to each leg (not shown in photographs) remotely controls the tilt angle and height of the stage. Credit: Sumeet Mishra. Researchers from North Carolina State University have developed a new technique that takes advantage of gold nanoparticles to trigger the sequential unfolding of three-dimensional structures using different wavelengths of light. Specifically, the technique makes use of the fact that different shapes of gold nanoparticles convert different wavelengths of light into heat. In this instance, researchers embedded gold nanospheres and nanorods into different areas of a shape memory polymer. The polymer can then be folded into a desired shape. When exposed to light wavelengths of 530 nanometers (nm), or green light, the folds in the part embedded with nanospheres unfold. When exposed to wavelengths of 860 nm, or near infrared, the nanorod-embedded regions unfold. "This approach can be used at room temperature, and allows for significant flexibility, since you can control the wavelength that the material responds to by manipulating the shape of the gold nanoparticles," says Joe Tracy, an associate professor of materials science and engineering at NC State and corresponding author of a paper describing the work. 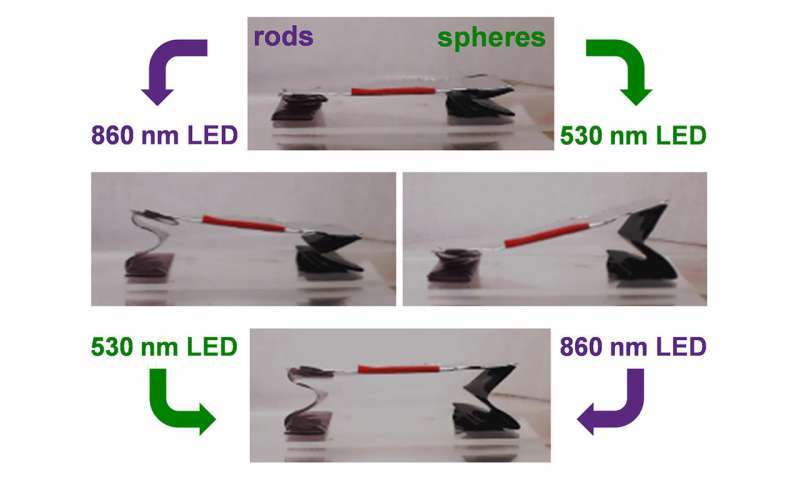 "This is an important advance because it directly connects the tunable optical properties of noble metal nanoparticles with remote triggering of sequential processes for applications in soft robotics, such as biomedical implants," Tracy says. A related technique developed at NC State to direct sequential folding is to place colored inks on one side of prestretched polymers, which heat up and bend when exposed to different wavelengths of light. The paper, "Sequential Actuation of Shape-Memory Polymers through Wavelength-Selective Photothermal Heating of Gold Nanospheres and Nanorods," is published in the journal Applied Nano Materials.